Southern Russia's Mt. Elbrus (5642 meters) is Europe's tallest mountain. It is a very special place. In addition to the clean mountain air, the mountains are worth a visit for their spectacular views. Georgia, Armenia, Azerbaijan, and Russia are all visible from the summit of Elbrus, as well as the starry night sky in such splendor as you’ve never seen before. Rising more than 5600 meters above sea level, Elbrus is called the “two-headed mountain” because it consists of two peaks: the highest western point and the highest eastern point, which is lower than the western by just 21 meters. Elbrus has always been a natural destination for climbers attempting to conquer the world's highest peaks. Just as Everest, the highest peak in the world and located in Asia, is called a “cemetery without crosses,” Elbrus, the highest peak in Russia and Europe, is acknowledged as a deadly place. According to experts, this extinct stratovolcano in the Caucasus claims the lives of roughly 15-30 mountaineers each year. On Elbrus at an altitude of 4200 meters there is a rock known as the “cemetery of climbers,” bearing the signatures of those whose lives would be tragically cut short. 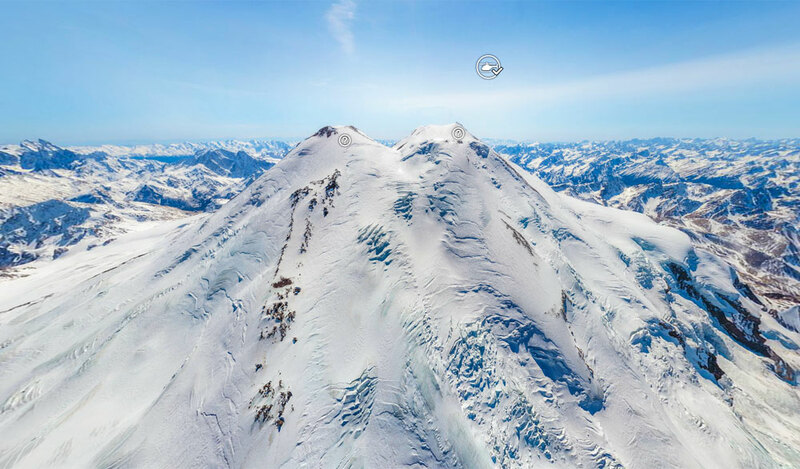 The photo panorama shows detailed views of Mt. Elbrus, including one at an altitude of 6000 meters and one over the Dzhiluzu Valley and the nearby mountains. The panorama also captures the Terskol Observatory (at an altitude of 3 km above sea level), Tsimiti (one of the oldest Ossetian settlements, known as the “town of the dead"), the Mir space station at night, and the North Ossetian Reserve.